Today I found out what grog was originally made from. Although today the word “grog” has more or less turned into a slang term to refer to just about any alcoholic beverage in many parts of the world, particularly in Australia and New Zealand, grog was originally just a mixture of rum with water, sometimes with a bit of lemon or lime added to sweeten it. Grog was invented by sailors in the British Navy a few centuries ago. Freshwater aboard sailing ships tended to become slimy with algae and other microbes growing in it. This made the water quite unpalatable. To try to get around this, sailors were issued rations of beer or wine to mix with the water to improve the taste. However, this proved to be impractical on long voyages as it took a significant amount of beer and wine, which had to be stored aboard the ship. Around the 17th and 18th centuries, rum began becoming very popular and it was soon common to substitute rum for the beer or wine ration. Rum is much stronger than beer or wine, particularly then, and so a smaller amount could be given (often around a half a pint per sailor per day). This change (allowing for a substitute of a half pint of rum instead of the normal one gallon of beer per day) was officially made in 1731 when it was added to the Regulations and Instructions Relating to His Majesty’s Service at Sea. Unfortunately, because the rum was so much stronger, the sailors tended to get pretty drunk from it, particularly when they’d choose save up their rum rations and drink it straight, rather than mix it with water. This caused problems aboard the ships, as one might expect. In order to solve this problem, British Vice Admiral Edward Vernon began requiring that the rum be mixed with the water before giving it out to the sailors as part of their rations. This order originally went out on August 21, 1740 with the precise mixture being two quarts of water with one pint of rum. This was to be mixed and distributed twice daily under the close scrutiny of the Lieutenant of the Watch. 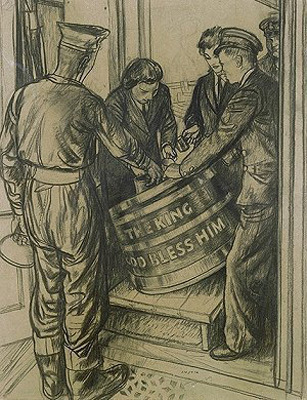 Other commanders used different ratios, but the general idea of mixing the rum with the water before distributing it to the sailors caught on throughout the Royal Navy and became the official standard practice in 1756. The name “grog” is thought to be named after Vice Admiral Vernon. The Admiral’s nickname was “Old Grog” due to the grogram cloak he wore. Grogram was just a course fabric, usually made from a blend of wool, silk, and mohair, and tended to be stiffened and made waterproof with gum. Another famous thing named after Admiral Vernon, this time directly rather than through a nickname, is Mount Vernon, President George Washington’s estate. George Washington had a half brother, Lawrence Washington, that served under Admiral Vernon. When Augustine Washington, their father, died, Lawrence Washington inherited the estate and change the name to Mount Vernon, from the original name of Little Hunting Creek, as it had been called while Augustine Washington lived there. George Washington later inherited the estate and chose to keep the name. The practice of serving grog as part of British Naval rations continued on all the way to July 31, 1970, though since 1850 the amount of rum put in the mixture steadily declined and officers were forbidden to drink it starting in 1881. Pirates tended to not drink grog as the navy made it, but made a modification of it, which they called bumbo. They’d mix the standard rum and water, as in grog, but then would add sugar and nutmeg. While grog was extremely popular throughout the navy, many merchants discouraged ships they hired from serving it to their crews as sailors still tended to get a little drunk from it, which caused problems at times. As such, it wasn’t uncommon for captains to be given bonuses if they didn’t serve grog or any other alcoholic beverage while they shipped goods. It is thought that rum was first substituted for beer or wine rations in 1655 when Vice-Admiral William Penn captured Jamaica only to find inadequate stores of beer and wine to give to his sailors. Instead, he simply used the rum available and came up with what he considered a reasonable substitute amount given the strength of the rum. Today in Sweden, grog generally refers to any alcoholic drink made from a mixture of soda, fruit drinks, and some type of alcoholic beverage. In Fiji, on the other hand, grog refers to water mixed with a fine powder made from sun-dried kava root. The U.S. Navy also initially adopted grog. However, due to supply problems that resulted in needing to import much of the needed rum, rye whiskey began being used as a substitute for rum and this quickly became more popular among the sailors and grog was phased out. This mixture of rye whiskey and water was called “Bob Smith”. Some have disputed the origin of the name “grog” being from Admiral Vernon’s nickname of “Old Grog” due to the fact that Daniel Defoe supposedly used the word in one of his works in 1718. However, this is incorrect, the actual word cited that he used was “ginger”, not “grog”. While overall Vice Admiral Vernon was considered a great commander who suggested and implemented many positive changes in the British Navy, as well as led many impressive campaigns, he once committed a monumental blunder, along with Major General Thomas Wentworth, during The War of Jenkins’ Ear between Great Britain and Spain. This blunder had significant ramifications on future events, particularly allowing Spain to maintain a major presence in the Americas until around the 19th century. Specifically, in April of 1741 he attacked Cartagena de Indias near present day Columbia. Because his forces so drastically outnumbered the opposition, Admiral Vernon sent word back to England before the battle that they had successfully taken the city. Unfortunately for him, the 26,600 men and 186 ships with 2,000 cannons under the command of himself and Wentworth were repelled by just 3,000 Spanish troops, a couple thousand others, such as 600 Indian archers, and 6 ships. They suffered further defeats later on, with Admiral Vernon largely blaming General Wentworth, who he felt was completely inept. In the end, they lost a large portion of their forces thanks to various sicknesses, such as yellow fever, and they ultimately retreated back to England in the end of 1742, though the war went on until 1748. All total they had lost 18,000 of their troops and 50 ships in about a year and a half. The odd name of the war, The War of Jenkins’ Ear supposedly came from an actual man losing his ear (though some historians debate whether this truly took place as is commonly told). Supposedly, while returning from the West Indies in 1731, Captain Jenkins’ ship was boarded by the Spanish and Jenkins was bound and had his ear cut off. Jenkins later brought this matter before the king and then the House of Commons, including showing his severed ear which he had stored in a pickle jar. Because there were many other such incidents also being brought before Parliament, they voted to try to first use diplomacy to resolve the issue with Spain, but later decided to go to war, sending a fleet to the West Indies to deal with the Spanish directly there. Before 1984, the legal age for drinking in the United States varied greatly from state to state, but was set at 18 years old in many states. In 1984, the Federal government passed the National Minimum Drinking Age Act, which didn’t actually set into law a national drinking age at 21, but rather required all states to raise the minimum age that people could buy or possess alcohol in a public place to 21 (excepting for religious or medical reasons, and it wasn’t required that any such law be implemented that restricted possession of alcohol by minors in private clubs or establishments). As you may have noticed from that, despite the name of the act, the actual minimum age to drink alcohol wasn’t part of this act, strictly speaking. The penalty for states that refused to comply with this act was that they would receive less funding for highways. States quickly fell in line and many even went further and passed laws forbidding the drinking of alcoholic beverages by people under 21 (excepting for religious and medical exemptions). This act was primarily passed as a response to the perceived excessive drunk driving accident numbers in the United States at the time, particularly by 18-19 year olds. Although the topic started off as essentially a British Navy article, there is considerable reference to US History so I assume it’s written for an American audience. Not mentioned in the article is the British (Imperial) system of measurements. At the time, there were two measures … one for wine and one for everything else. The US adopted the wine measures for all things; the British used the standard measure for everything (except wine) pretty much right up to the adoption of the metric system about 30 years ago. Not only gallons, quarts, and pints differed, but also the size of ounces. Although the British System of Measures changed in 1824, the liquid measures are the same before and after, the later system is known as the Imperial System. A gallon of wine would be 132 ounces, a gallon of beer or rum would be 160 ounces. Because the ounces themselves varied, the ratio is 80:100; a wine gallon is 4/5ths a beer or rum gallon. It would be interesting to know whether the wine and beer measures were identical (ie both used the wine gallon) since the story implies they were substituted freely, and the ship’s hold is fixed in size. Or, perhaps due to confusion with the measure system when reading accounts referring to Gallons, whether sailors were given a physical quantity of beer 25% larger than wine, since wine is stronger and that fits the measures at the time. The rum ration mentioned in the story … a half pint per day … would have been English/Imperial standard units, however. The wine measure was never freely used for other items. A “half pint per sailor per day” would be 10 Imperial Ounces of Rum per day; Mixing one pint with two quarts gives 20 Imperial Ounces of rum and 80 Imperial Ounces of water, mixed. Basically, a 1:4 ratio. Assuming 50% alcohol by volume (typical distilled spirit strength; it’s often watered down to 40% for bottling) that’s a ration of two quarts grog with an alcohol content of roughly 10~12.5% per day, enough for 10 8 Imp. ounce glasses @ about 12% alcohol by volume. Using modern US beer measures, where alcohol is measured by weight, not volume, and where a 12-ounce bottle is about one half US ounce larger, that’s equivalent in alcohol content to a half case (12 bottles) of 4.2 beer a day. The article needs to be corrected. “British Navy” is incorrect. It is actually called the Royal Navy. Captain Jenkins was considered a stubborn smuggler by the Spanish. He was many times arrested, and freed under his word of not doing it again. Finally, the only way to convince him to quit, was cutting his ear, but giving it back to him as a “souvenir”. This incident caused a war , where the English Fleet of Admiral Vernon was clearly defeated by the Spanish in front of Cartagena (de Indias). The famous song “Rule Britannia” was written to honor Vernon’s false victory.